A sheriff sent out a warning to metal thieves this week by fining a first offender £525 for stealing a broken washing machine and a piece of steel fencing. Sheriff Martin Edington told Kevin Mackay: “This type of theft is all too common, so you’re going to learn a very expensive lesson today. He warned he would be much less lenient if Mackay appeared before him on similar charges again. Mackay (24), from Bridgend, pleaded guilty to stealing the metal from a demolition contractors’ site on nearby Broxden Bing in November 2013. He also admitted failing to turn up to court for an earlier hearing. 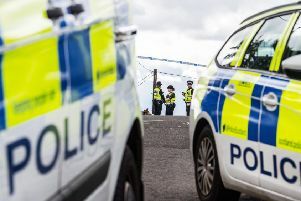 Alastair Macleod, prosecuting, said a local resident called police after seeing a group of men with a white van at the scene, who appeared suspicious by their actions. A member of staff from the site’s owners, Hunter’s Demolition, was dispatched to the site and found the men with various bits of metal in their possession. He blocked their van in with his lorry until police officers arrived on the scene. Mr Macleod said: “Mr Mackay indicated at that stage that he’d only taken a broken fridge which he had found at the edge of the fence. Alan Jackson, defending, said Mackay – now employed as a £300 a week driver with a kitchen company – had been out of work at the time. He thought he could sell the metal as scrap to make a little extra money. Mr Jackson commented: “He told the police: ‘I saw a pile of scrap metal and just thought I’d take it.